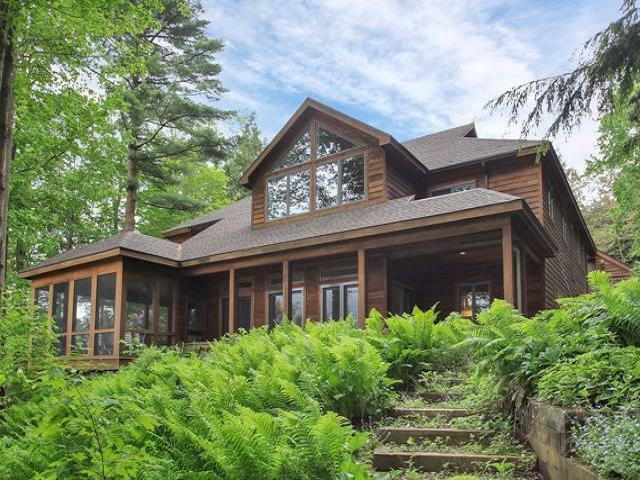 Tranquil & secluded lakefront getaway on 4 private acres across from Long Point. A rare opportunity to own 400 feet of waterfrontage on Chautauqua Lake! Custom 4400 sq ft cedar home features an open floor plan, soaring ceilings, stone 2-sided fireplace, master suite with private deck overlooking lake, 4 bedrooms with access to deck or balcony, several bonus rooms, and amazing lake views from multiple decks, patios & porches. The landscaping is natural, low maintenance, and lake-friendly. This is one of the deeper parts of the lake, with great fishing from the dock. Aluminum dock & lift are included. Savor the solitude and the seasons year-round, or enjoy as a welcoming summer retreat for family & friends. Priced lower than recently appraised value! Directions To Property: Turn Off 394, About 1.5 Miles North Of The Bridge, As If You're Going To National Grid. Continue Straight Back & Follow Gravel Driveway.